One of our most popular & best selling tires! 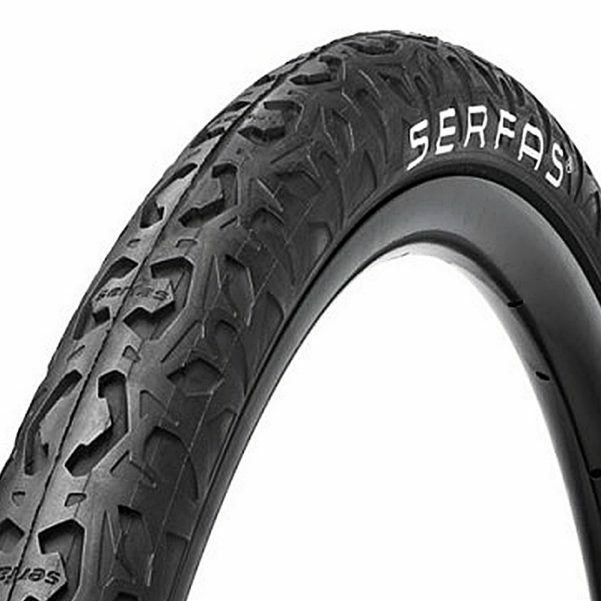 Utilizing a smart inverted tread pattern the Serfas® Drifter is designed to be an ace both on pavement and off road. 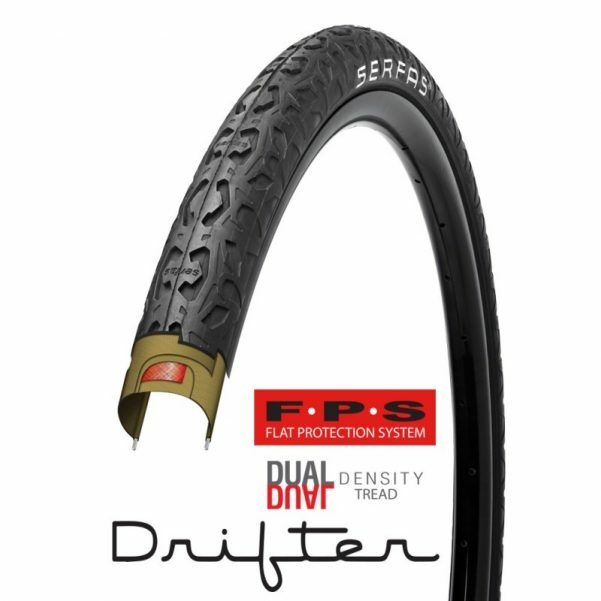 With Serfas® Drifters you will be sure to feel the freedom and have confidence to ride whatever environment you may find yourself in. Great tire, rolls fast and plenty of traction on hard pack trails. Highly recoment this tire for the money. I ONLY HAD ONE BIKE, (A HARD TAIL MTB) SO I GOT THESE TIRES SO I COULD HAVE A BETTER RIDE ON THE ROAD. IT MADE A HUGE DIFFERENCE IN MY RIDE. SO MUCH SMOOTHER AND EASIER TO KEEP UP. IT STILL GIVES GOOD TRACTION OFF ROAD AS WELL. these tires are awesome. i got 2inch and they are phat. pumped up to the max they are just as fast norm slicks, tougher and better off road than boring slicks. i treat them mean and never had a puncture. you will always get comments from other riders when you have them on your bike. buy them! Nice fat tire that looks good and rides well. I actually gained 1 extra mile per hour on my Ebike making it 27mph. So very low rolling resistance. I rode from California to Colorado and even did the Kokopelli’s Trail and no flats in 1300 miles. Great bang for the buck 29’er tire. These are the best tires made. I have two bikes that I use about equally. One bike used up two sets of tires and gave me all my tire problems, while the other, with Serfas Drifters showed only slight wear and never had a flat. I bought a second set of Serfas for the other bike and now tire problems are a memory. they seem like they’ll last forever. Really great tires. I ride 3 bikes, and different tires on all. These are the only ones I have not had a flat on this year. Very impressive. Rolling resistance is minimal. Grip is good, wet surface handling is confident and secure and quiet as well. I use the 26×2.0 size. I strongly recommend! I use a set of these tires in police cycling. With about 1500 miles in the current set, I have half tread left. Stairs, curbs, light snow, and other obstacles have been navigated with no problem. Off road, heavy gravel, and some multi-surfaces are a bit more challenging. Extreme grade, down hill on turf was not a pleasant experience (couldn’t stop – even with rear wheel locked up). The decreased rolling resistance of the tread design translates to increased speed when it’s needed and aids with slow speed precision movements as well. Considering the extreme demands placed on equipment used in public safety cycling, I think these tires performed well above average. When the time comes, I’ll put them on again and will install them on my personal mountain bike as well. Needed some new tires for my Gary Fisher mountain bike and wanted something less aggressive that what came on it, after talking to a salesman at the bike shop he sold me on these. He assured me that these where what I was wanting based on by expectations of my new tires, so I bought them. The only bad part was that I went in there looking for only brake pads but decided some tires were needed too. So I left there and but them on and rode around in the rain and noticed a huge difference! Wow! Will definitely be recommending these tires to all of my friends. Awesome tire. I swapped them out from my knobby tires and they’ve made all the difference on the road. I have had them for over a year now and they look like new still. The writing on the sidewall hasn’t faded at all. Great tire for the money. I ride mostly rail-to-trails and other paved trails. My bike is a Trek Mamba that came with the stock tires, but I found that they were noisy and seemed to have a lot of rolling resistance. My local bike shop, Competitive Gear recommended these tires. I ride a paved trail, nightly around the Lake Erie Peninsula state park and measure my time and distance using my Iphone4 and a bike App. I found that these tires, knocked off my best time by 6 minutes and that was in a strong headwind that day. I am very satisfied and highly recommend them to other 29er’s who have similar riding habits. They have made my daily rides so much more enjoyable! i installed a pair of these tires on my bike back at the beginning of July last summer, and I have taken them into places where most tires would fail. I have literally coated both tires with goatheads thorns and never lost any air pressure what so ever. Highly recommend these tires for the desert riding enviroment. Awesome tire for commuting: great price and bulletproof. I have used these tires on both my 26r and my 29r. They do not show much wear after 4+ years of commuting and as of yet, I have never had a flat. Great rolling resistance for use of the road and some off road. Plan to keep using them for everyday purposes. I have had the Serfas Drifter tires of for over 8 years, I am finally getting a new pair for my 21 speed GT Talera. LOVE these tires. It helps to rotate them to have them last longer. 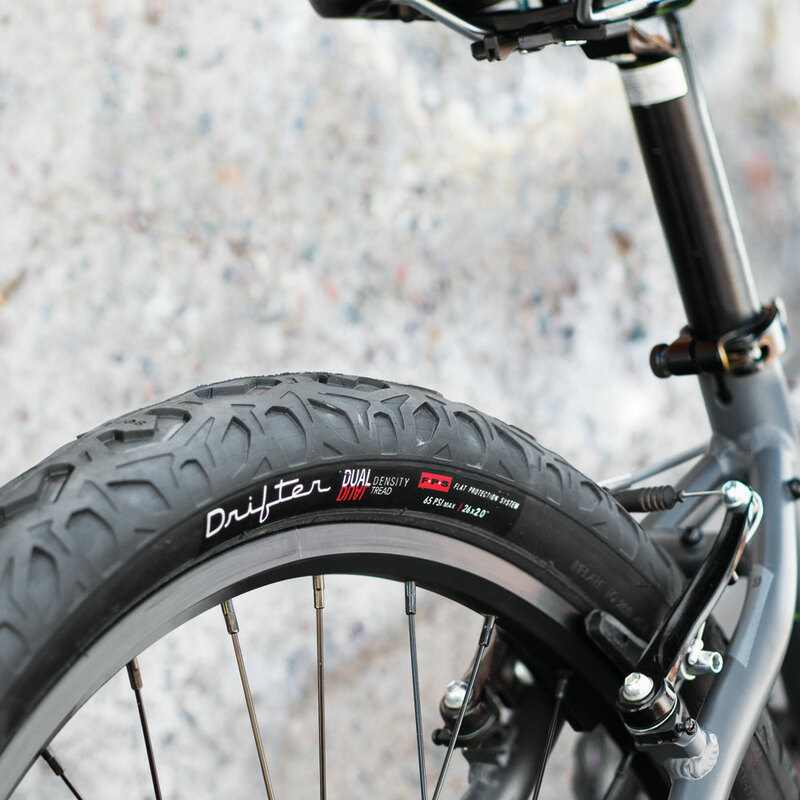 The right tire will make any bike fun, these tires do that. Perfect commuter tyre. I’ve had the drifter 29×2 on my daily commuter for 12 months now and in that time I’ve only had three flats. Previously on the maxxis ignitor tyres that came with the bike I used to get one or two flats a week. Surprisingly easy to get on and off the rim too, considering how stiff the sidewalls are. The only negative is the weight, they are extremely heavy, but on a commuter this is not really an issue. Perfect mountain bike tire for road, then trail and back to road, all in one ride. Handles all with low rolling resistance and traction when needed! I bought these tires on the recommendation of the local Specialized dealer, as I was looking for a faster tire for my daily commute across Sydney (~20km/12 miles) on my 29er MTB. After about a month and a half of use, I am really happy with their performance – no flats, excellent handling in all sorts of conditions and about 2km/hr faster due to the lower rolling resistance. I even took them out on the trails last weekend and they handled it without skipping a beat. Great tires ! Put these on my TCX in July and haven’t had a flat after 1400 miles and they hardly show any wear. Absolutely happy with the performance, Will definitely replace with these when my current set wears out , whenever that occurs.